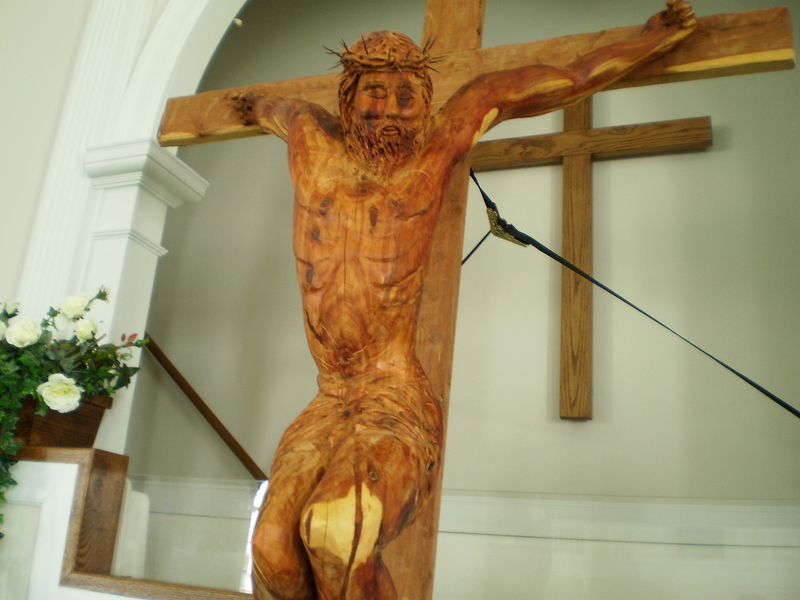 This wood sculpture is on display in my church until Good Friday. Once he found the right tree, it took David Marks 30 hours to complete it. He told me he couldn’t take the credit. It was as if God’s hand guided him. 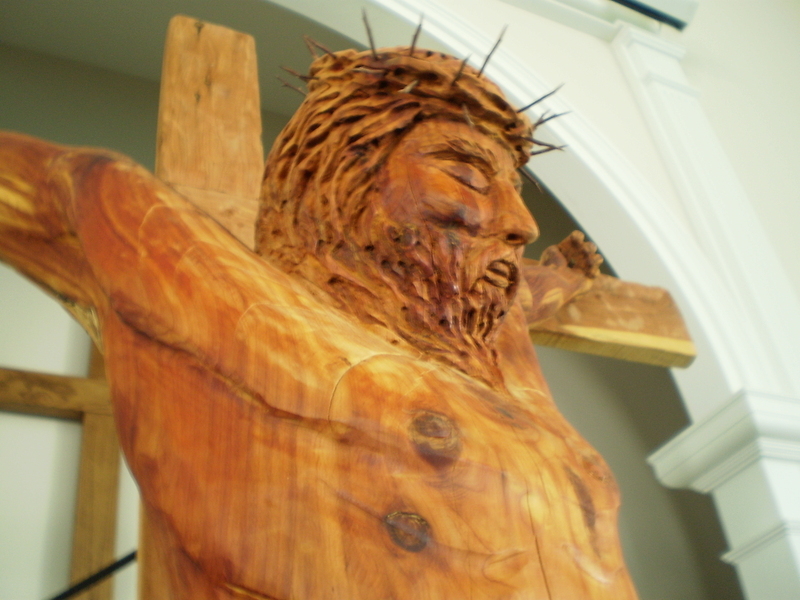 The body is carved from a single cedar tree. My camera doesn’t do it justice. I’m amazed. A truly inspired work of art. Thank you, Mr. Marks, for sharing your gift. 1Then Pilate took Jesus and had him flogged. 2The soldiers twisted together a crown of thorns and put it on his head. They clothed him in a purple robe 3and went up to him again and again, saying, “Hail, king of the Jews!” And they struck him in the face. 13When Pilate heard this, he brought Jesus out and sat down on the judge’s seat at a place known as the Stone Pavement (which in Aramaic is Gabbatha). 14It was the day of Preparation of Passover Week, about the sixth hour. I’m the only one in my household that likes watching TV with the closed-captioning turned on. What can I say, I love to read. The words are very important to me. I’m glad I had the subtitles turned on when I watched the movie, Bright Star, because it is all about words–the words of poet, John Keats. Another such quote I must add to demonstrate the mind and heart of a writer. The words are spoken by Mr. Brown, “If Mr. Keats and myself are strolling in a meadow or lounging on a sofa or staring into a wall, do not presume we are not working. Doing nothing is the musing of a poet.” and might I add the musing of a fiction writer, as well. I should make Fanny Brawne my spokesperson for Put A Ruffle On It since, as a designer and seamstress of clothing, she made the most beautiful of ruffles (at least on screen). Yesterday I wrote about Liz Curtis Higgs’ new book. I found this interview on youtube and wanted to share it. It’s almost fitting that Mrs. Higgs’ new book, Here Burns My Candle, comes out after Tiger Woods’ indiscretions were made public–making what happens in the book all the more plausible while at the same time, heartbreaking. The author is masterful at taking stories from the Bible(The book of Ruth in this case) and weaving them into page-turning novels set in Scotland. Loved the book! For more information about this book, visit WaterBrook Multnomah. This book was provided for review by WaterBrook Multnomah. I wish I could be this smart. Watch to the end. Jesus said to come as little children, so it was with crayon in my hand that I began reading The Gospel According to Moses –What my Jewish Friends Taught me About Jesus by award-winning novelist Athol Dickson. You see, my son rarely used his crayons when he was little so I have quite a few of them in my house and I thought I’d put them to good use. They are very handy as highlighters. Maybe not as professional looking, but they still highlight the text I think is important. And let me say, there were many such texts in this book. And he says his intent was not to proselytize but he also didn’t want to leave the reader untouched. And he certainly didn’t leave me untouched. For reasons I can’t explain, somewhere in chapter eleven I began to weep. Not silent tears, but deep sobs. And I couldn’t stop. I read the remainder of the book through a veil of tears. The funny thing is, the author said early on how a painting made him weep, and I thought, that has never happened to me, and yet by the end of the book I was crying. When I finished reading, I had to rush to get a shower because I had a hair appointment at 9:15(Saturday morning). I cried while I took the shower and cried while I dressed. I was trying to think of ways to stop the flow of tears, but couldn’t. I didn’t want to bawl as my hairdresser did her thing. Fortunately, I was able to pull it together, but those early morning tears wiped me out for the rest of the day. But I don’t regret them one bit. I don’t cry often or that easily. It had been months–many months since my last cry. My friend said that tears are God’s pressure release valve. I needed those tears yesterday. And again, I felt I came to Jesus as a little child bawling her eyes out.